Denon HEOS wireless speakers let you play your music all over the house. The speakers connect to your home network, and you can control playback and group speakers together using the HEOS app. 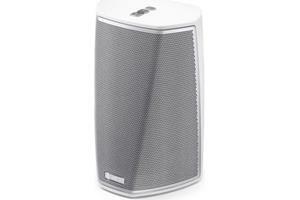 There are several different speakers available for different-sized rooms. No matter the size of your room, there's a Denon Heos speaker that can fill it with sound. Denon offers four different speakers that you can control from the Heos app. 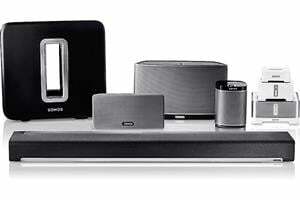 All Heos speakers give you the option of connecting wirelessly over your home network or Bluetooth, plus USB and aux inputs for even more options. 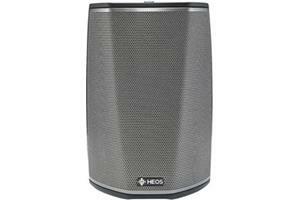 The Heos 7 puts out big sound for big spaces. It's great for living rooms, patios, or open-floor-plan homes. 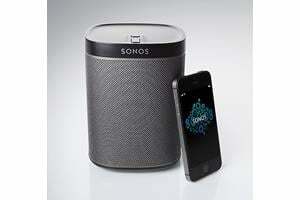 It features 7 drivers, including a subwoofer and passive radiators for deep, rich bass. The Heos 5 fits your master bedroom, dining room, or other medium-to-large room. It has 4 drivers, plus a passive radiator to enhance the bass. Small rooms, like most bedrooms, offices or kitchens are an ideal spot for the Heos 3. It's compact, but puts out a lot more sound than you'd expect. For its size, it puts out a surprising amount of bass, and its small footprint makes it easy to fit into a smaller room. The Heos 1 features humidity resistance, making it a great choice for the bathroom or a covered pool area. You can add a second one and use the app to make a stereo pair. There's even an optional Go Pack which turns it into a portable speaker with 6 hours of battery life. The free Heos app ties all of your different speakers together. Its beauty lies in its simplicity and ease of use. You can download it to as many devices as you want, and play your music wherever you have a Heos speaker installed. You can easily group different speakers together, or play different songs in different rooms at the same time. Heos works with your existing music collection, plus a bunch of streaming services like Spotify, Pandora, Tidal, and more. 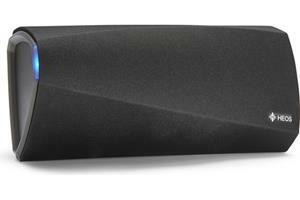 No matter what Heos speaker or speakers you choose, you know you're getting the great sound Denon is known for. If you have any questions, please give Crutchfield a call. What is the difference between Heos and PlayFi?